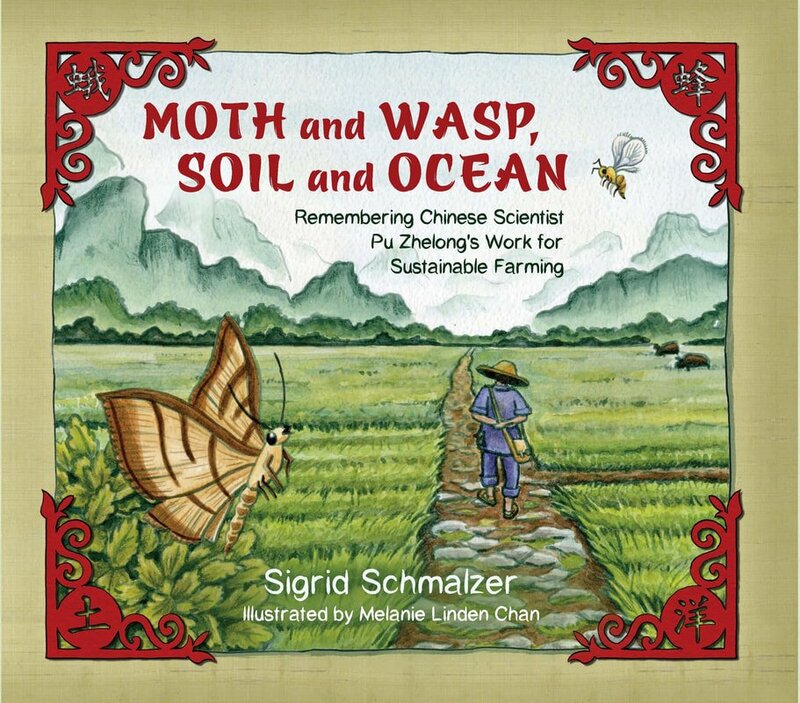 A farm boy in China relates the tale of Pu Zhelong, a scientist and conservationist, and introduces readers to early research in sustainable agriculture practices in MOTH AND WASP, SOIL AND OCEAN. Through a series of flashbacks, author Sigrid Schmalzer reveals how invasive moths and beetles were destroying precious village crops. When villagers try to defeat the pests, their methods repeatedly fail. As the threat of famine looms, Pu Zhelong, an outsider, arrives bearing new, untested scientific ideas. Can Pu Zhelong save the rice crop without using harmful and ineffective pesticides? With patience, restraint and deference, Pu Zhelong eventually wins over the skeptical villagers. His innovative methodology, introducing parasitic wasps to destroy the crop-consuming moths, led to a successful and sustainable victory for the farmers. Schmalzer’s imaginative and informative text weaves a tale that will engage young scientists with its ingenuity and sophistication while celebrating this little-known environmental hero. Debut illustrator Melanie Linden Chan pairs intricate and multi-layered images with the factual content, making this book a pleasure for young readers to pore over. Structuring the narrator’s flashbacks in a journal format, Chan cleverly weaves scientifically precise illustrations against a lush agricultural setting. Elements of Chinese art, history and culture frame the narrative in an engaging, pictoral manner that both delight and inform. An extensive endnote provides additional information on the history of the story, as well as suggestions for further reading. Also included is a detailed explanation of the decorative Chinese folk art papercuts utilized by the illustrator, and referenced to the pages where they appear in the text. MOTH AND WASP, SOIL AND OCEAN offers a unique, child-friendly perspective on a earliest origins of agroscience. Add this STEAM selection to your school or classroom library to add depth to collections on organic farming, sustainable agriculture and Chinese history.